Since 1980, more than 500 dust explosions have occurred in industrial facilities throughout the United States, causing over 180 fatalities, nearly 700 injuries, and hundreds of millions of dollars in damages.¹ For context, 115 of those occurred from 1994 through 2004, of which 58 were corn dust explosions in granaries or refineries and eight in flour processing or storage plants.² Although data on the root cause of these explosions is somewhat limited, it could be that an unqualified electric motor may have played a role in many incidents. With internal components rotating at high speeds, electric motors can produce sufficient heat to make them a potential ignition source. As a result, when a motor is misapplied in combustible or flammable atmospheres, they can pose a serious threat to facility safety. As is often the case when protecting against any catastrophic event, the threat associated with operating an electric motor in a combustible environment can be effectively mitigated through careful risk assessment and proper product selection. Unfortunately, this is a task that is much easier said than done, since it requires consideration of various motor characteristics and environmental variables—many of which are difficult to accurately quantify. 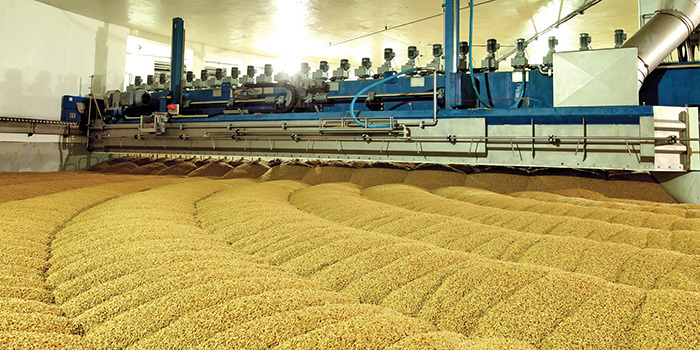 Even in facilities where experienced professionals are responsible for equipment selection and installation, it is not uncommon to see the use of unqualified motors in hazardous locations. In many cases, this is something that goes undiscovered until a safety incident occurs, or it is caught during an inspection from a regulatory body. Operations personnel and engineers can better understand the many factors that go into hazardous duty motor selection so that the risk of dust explosions in facilities can be substantially reduced. In most industrial facilities, particularly those that process, store or handle fine particles such as flour or grain, the first four elements are virtually always present. In such instances, if there is sufficient heat, whether from an electric motor or other source, and a high enough concentration of material in the air, deflagration (i.e., rapid combustion) can occur. The fifth element of the pentagon, confinement, is what can cause deflagration to result in an explosion. In confined spaces, dust particles can remain suspended for long periods of time, causing the concentration of combustible materials in the atmosphere to continuously increase. In the event of ignition, flame propagation through the air can generate a strong pressure wave that exerts sufficient force to buckle concrete floors, damage roofs and severely injure personnel. 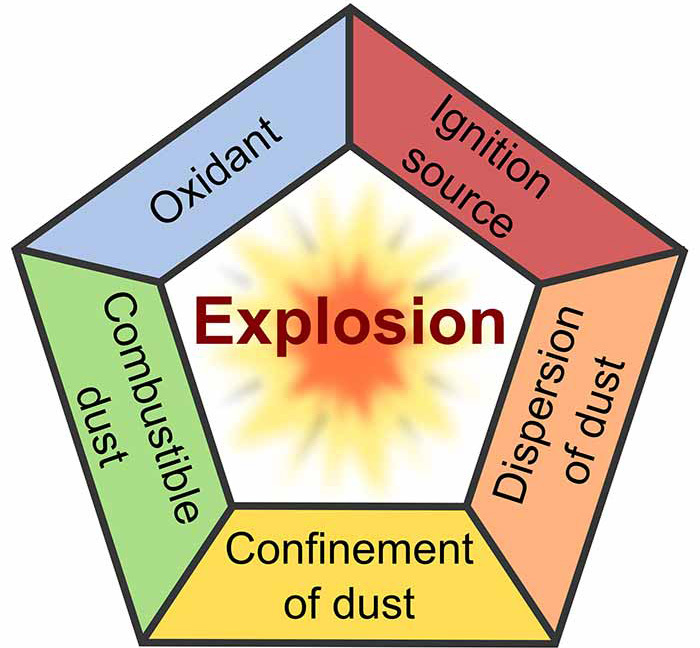 Confinement is the most difficult element of the Dust Explosion Pentagon to control for the simple reason that every facility, to some degree, must be confined. In certain regions, there may also be environmental regulations in place that prohibit the release of dust into the outside environment, which further complicates matters. History has shown that the most effective way to prevent any type of fire or explosion is by managing potential sources of ignition. As a result, ensuring that motors are qualified for operation in hazardous locations is of the utmost importance. A hazardous location is defined as “any area where fire or explosion hazards may exist due to flammable gases or vapors, flammable liquids, combustible dust or ignitable fibers or flyings.”⁴ Whenever an electric motor is to be installed in a location that meets the above description, it is the responsibility of the end user to ensure that it is qualified for operation given the level of risk posed by its surrounding environment. Even for experienced professionals, this can be a difficult task that requires a firm understanding of how to classify hazardous locations. In the U.S., classifications are defined by the National Fire Protection Association (NFPA) 70: National Electric Code (NEC), which designates locations according to Class, Group and Division.